The sound of a leaky faucet echoing throughout the home is a cause for concern for homeowners. Not only does the steady drip of water add up to a higher water bill, it could also be causing damage or linked to a larger issue. It is important not to ignore the drip of a faucet or leaking water elsewhere in the home but rather get to the bottom of it and find the source. 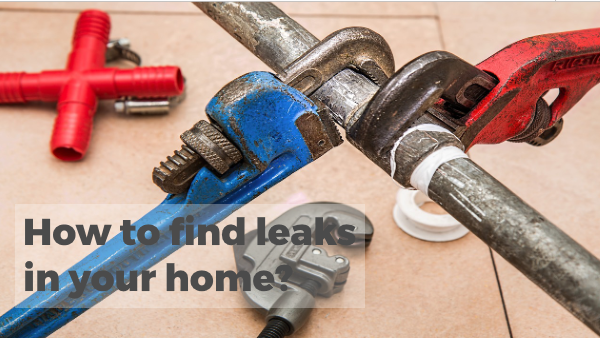 Fortunately, there are several ways to determine the source of a leak. Soon that drip, drip, drip will be gone, gone, gone. The first step is to check the water meter. To do this there needs to be no water used in or out of the home. So, make sure no sinks or showers are running and that no one is using the dishwasher or washing machine. After this, check the leak indicator on the meter to see if it is moving. The leak indicator might be a small silver wheel or a triangular dial that rotates if water is finding its way through the meter. If this deal is in motion, you most likely have a leak. Another option with the meter is to take a meter reading and then wait. In the one to two hour waiting period, don’t use any water. If the reading still changed, then you have a leak. A leaky faucet is rather easy to diagnose and quite simple to fix. If the faucet is leaking, chances are there is a worn rubber washer to blame. This is located under the handle and is relatively easy to fix. It will require stopping water supply through the shutoff valve and removing the handle entirely. This leak is harder to find. A leaky toilet is often silent but can lead to hundreds of gallons in wasted water and money. To see if the toilet is the source, you can try a neat trick by adding just a few drops of food coloring into the back part of the toilet tank. Refrain from flushing the toilet and wait. If the any color has made its way into the toilet bowl, the leak is there. If not, the leak is most likely coming from somewhere else. Of course, the leak might be coming from outside the home. If there are certain locations on the property that are always wet, there may be a leak there. If the driveway, street, or curb always has a consistent puddle or a darker spot, there may be an underground leak. In this scenario, call in an expert. In finding the source of a leak, sometimes it is necessary to work from the top down. There could be roof water leaks working their way to the rest of the house. One way to test this is to wet the roof and then watch the identified problem areas to see if any water makes its way inside. Just like with dye in the toilet bowl, coloring the water is a good way to find a leak. An example of this is adding dye to the water of a shower pan, the waterproof pan between the subfloor and tile of a bathroom. If the colored water makes its way to the walls below where water has been seen, the leak has been discovered. Poorly insulated HVAC ductwork can lead to excessive condensation and thus water in the home. This can rot the trim and jambs of windows so be sure to move quickly if this is the issue. At the end of the day if you have tried it all and are still scratching your head, call an expert. There are experienced plumbers all around who can diagnose and address the situation. A leak can cause wood rot and other damage to the home so it is not something to procrastinate on. Do the research and find a certified and licensed plumbing company, like tombaconplumbing.com, who is able to provide stellar customer service and results.